The 2680H High-Performance Disk is capable of field speeds of 10 to 14 mph. No matter a producer’s cropping practices or agronomic goals, John Deere continues to expand its offering of productive, versatile tillage solutions to meet their needs, including the new 2660VT Variable-Intensity Tillage Tool and 2680H High-Performance Disk for model year 2019. “The 2660VT Variable-Intensity Tool with its adjustable gang angle is a true multi-season machine that features an all-new frame and the right amount of weight per blade to handle a wide range of soil, crop residue and field conditions at operating speeds up to 10 miles (16 km) per hour,” said Jarred Karnei, John Deere tactical marketing manager for tillage equipment. The 2660VT is available in six models with working widths from 20 to 50 feet (6.1-15.24 m) in three- and five-section configurations. Customers have a choice of tire options to suit their specific needs, including radial, bias or high-flotation tires. Walk-Over™ tandem wheels provide maximum stability and flotation, and stabilizer wheel options are available, based on configuration. Front-mounted active-hydraulic depth control castering wheels on outer wings are standard on all five-section configurations. The 2660VT has compact transport dimensions to help operators get between fields with ease. The three-section models are under 14 feet (4.27 m) high and five-section models fold to less than 15-1/2 feet (4.72 m) wide. More importantly, the 2660VT allows operators to customize the gang angle from 0 degrees for sizing residue and vertical soil movement, to 12 degrees for aggressive horizontal soil movement and to bury crop residue. Operators can quickly and easily adjust gang angle with a manual slider or utilize TruSet™ Tillage Technology for more precise, one-degree adjustments and prescription tillage capabilities from the cab. Automated, on-the-go TruSet tillage depth and rolling basket pressure adjustments, as well as documentation and prescription-based tillage on the Generation 4 Display, are standard on both five-section and three-section models. Other TruSet adjustments – for fore and aft gang angle, wing down-pressure and stabilizer wheels – are optional depending on configuration. The TruSet Side-to-Side system is also an option for more precise depth control of individual sections. Specifically, for the 2660VT, Deere is introducing the exclusive 22-inch (55.8 cm), heavy-duty Commander™ Blade with its double-cut edge to more easily penetrate hard soils and size and mix residue. This wavy straight blade on 7.25-inch (18.4 cm) spacings has a serrated edge and shallow concavity to fracture and lift hard soils with less smearing and is designed for low-draft tillage at maximum field speeds. The 2660VT also features the two-part ProFinish™ Leveling System with new hydraulic, double rolling baskets to more effectively reduce clods and pin residue based on soil and residue conditions. The front knife-edge basket is mounted in reverse to change the direction of the soil and knock down ridges, and the back flat- or round-bar basket breaks down clods and firms the surface. The 2680H High-Performance Disk is a true spring and fall tillage tool that combines speed and tillage performance in one machine. The 2680H is capable of field speeds of 10 to 14 MPH (16-22.5 KPH) to effectively till more than twice as many acres per day compared to traditional disks of similar size. 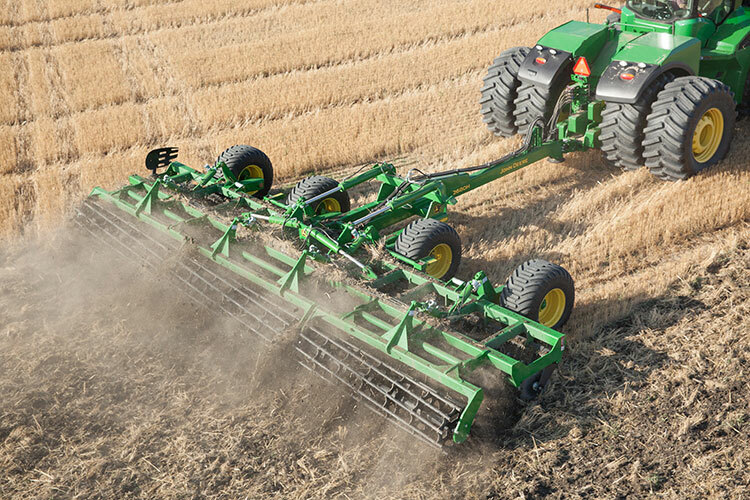 One unique feature is the individual 20-inch (50.8 cm) smooth or notched disk blades mounted on a rubber torsion suspension system with nine inches of travel that allows the blades to follow ground contours, ride over obstructions and spring back into position for a consistent field finish. The blades, on 10-inch (25.4 cm) spacings for maximum residue flow, are angled 17 degrees on the front rank and 14 degrees on the rear rank for aggressive horizontal soil movement and crop residue incorporation. Depth control is easy to set on the 2680H, thanks to a simple shim system. It also has greaseless bushings and bearings that increase uptime in the field by eliminating daily maintenance. The 2680H comes with a variety of rear finishing attachments, including standard cage roller, optional spring-tine or optional rubber rollers with hydraulically adjustable scrapers that reduce plugging even in sticky soil conditions. High-flotation tires come standard on drawn models of the 2680H to reduce soil compaction. Deere offers a wide range of sizes – 15 different models from 8-foot (2.4 m) mounted models to drawn models up to 45-foot (13.7 m) wide – to match customers’ acreage size and horsepower requirements. “Whether customers are looking for a high-performance, residue-burying machine or a highly versatile, multi-season tillage tool that can cover lots of acres quickly and effectively, the new 2660VT and 2680H add unique capabilities to our extensive tillage line up,” said Karnei. 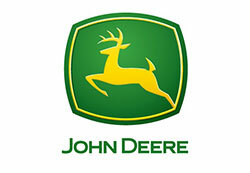 For more information on the new 2660VT Variable-Intensity Tillage Tool, 2680H High-Performance Disk and the other innovative tillage solutions from John Deere, contact your local John Deere dealer or visit JohnDeere.com/ag.